Since the hard fork in 2017, Bitcoin Cash has remained one of the largest cryptocurrencies. For much of 2018, Bitcoin Cash has been ranked as the fourth largest cryptocurrency by market cap. The only cryptocurrencies which have consistently remained ahead of it were Bitcoin, Ethereum, and Ripple. The Bitcoin Cash hard fork sparked an intense divide among some in the community with many businesses supporting mainly either Bitcoin or Bitcoin Cash. This can get confusing for users who don’t want to get involved in the political side of things. Regardless of the divide, Bitcoin Cash remains one of the leading cryptocurrencies and properly securing it is important for those who hold it. We present the highest quality Bitcoin Cash wallets that perform strongly over a range of factors including security, functionality, and ease of use. Hardware wallets represent the best security for the everyday cryptocurrency user. The three leading hardware wallets are Trezor, Ledger Nano S, and KeepKey. 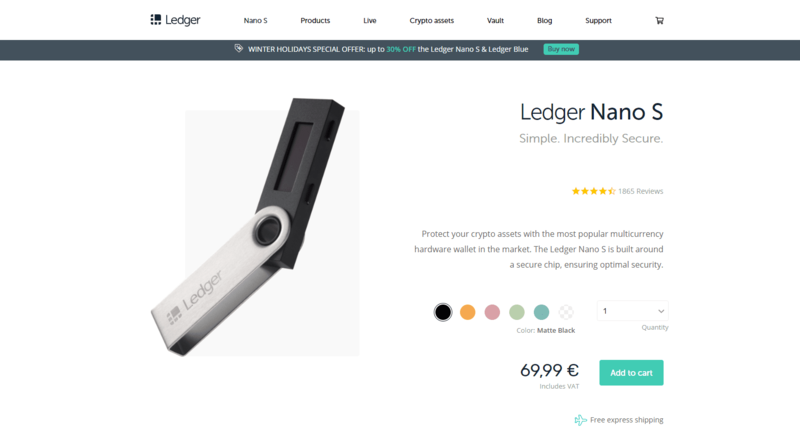 Out of these, the Ledger Nano S has support for the widest number of cryptocurrencies. Hardware wallets are the best level of security for the everyday user for a number of reasons. Hardware wallets leverage the benefits of both cold storage and hot storage. This wallet comes in the form of a device similar to a USB and is mostly kept disconnected from the internet. The wallet keeps the funds of the wallet in cold storage, meaning offline. The private key for the wallet is also stored in the device itself making it highly secure. Even if the device is used on a compromised computer, the funds will still be secure due to the private key being on the device itself and high levels of encryption being applied. The wallet is delivered in a sealed package. This enables users to know if the package has been tampered with before delivery. There are clear set-up instructions provided in the box. It is important for users to pay close attention when recording the recovery seed. This enables users to recover their funds in the case that the device gets lost or stolen. It is also important to store the recovery seed safely as if another person were to access the recovery seed, it would be possible for them to access the user’s funds on another device. Once the public key for the wallet is known, users can easily receive Bitcoin Cash transactions. If users wish to monitor their Bitcoin Cash balance or send transactions, they can connect the device to a computer. When connected to the computer, there is a Chrome-based app which users can use to manage their account. The interface is straightforward and clear to use. There are also mobile wallets which support importing the Ledger Nano S wallet so that users can monitor their balance via their mobile. This also enables users to generate a QR code on their mobile to easily receive transactions. You can learn more in our Ledger Nano S review. Trezor is another one of the leading hardware wallet providers which also supports Bitcoin Cash. Trezor have been the longest operating of the three major wallet providers. The wallet was developed by SatoshiLabs and the initial model was released in 2014. The initial version was the Model One. Satoshi Labs more recently released the Model T. The main differentiator is that the Model T has a colour touchscreen and no buttons. Trezor functions very similarly to Ledger Nano S. The device arrives in a sealed package so that users know if it has been tampered with. Clear set-up instructions will be provided and two cards to record the recovery seed will be included in the package. Users access the wallet to monitor their account via the Trezor.io website. Users can use their Bitcoin Cash address or generate a QR code to receive payments. Transactions can also be sent when the Trezor is connected. When the Trezor is not connected, the funds are kept in cold storage. Advanced encryption is used when connecting so that even if the device connects to a compromised computer, the user’s funds will remain secure. Similar to Ledger Nano S, there are mobile wallets which will enable users to import their Trezor wallets. This allows users to monitor their account via their mobile and also easily receive payments. Trezor also integrates with ShapeShift exchange so that users can exchange between the supported cryptocurrencies in the wallet. This is useful for users who wish to speculate on the price of Bitcoin Cash in relation to other cryptocurrencies. There are also other useful applications and integrations which can be used with the wallet. The Trezor password manager uses the advanced encryption of the hardware wallet to protect the privacy of users passwords. One of the advantages to Trezor is the SatoshiLabs team have a strong emphasis on making everything beginner-friendly. The set-up instructions are very clear and the team also consistently publish blogs explaining the functionality and features of the wallet. You can learn more in our Trezor review. Exodus is one of the most popular desktop wallets. The wallet is supported on Windows, OSX, and Linux. The wallet is a multi-currency wallet with support for almost 100 cryptocurrencies including Bitcoin Cash. The private key for the wallet is stored on the users hard drive and is encrypted. One of the most attractive features of the wallet is the interface. The interface is easy to use and enables users to view their cryptocurrency portfolio in one glance. Users can also easily navigate to their Bitcoin Cash account where they can send and receive Bitcoin Cash as well as monitoring the balance. The design of the interface is very intuitive to use and makes the wallet an attractive wallet for beginners. Exodus integrates with ShapeShift to enable users to exchange between the supported cryptocurrencies in the wallet. This enables users to speculate on the price of Bitcoin Cash against other supported cryptocurrencies in the wallet and also saves users the costs of transferring to an exchange to conduct trades. Overall, Exodus is one of the most attractive options as a desktop wallet to store Bitcoin Cash. Users are in control of their own private key, the wallet has good functionality, and the interface is designed to be straightforward to navigate. You can learn more in our Exodus wallet review. BTC.com who are owned by Bitmain offer a free and open-source wallet which supports both Bitcoin and Bitcoin Cash. Formerly called Blocktrail, the wallet was renamed when Bitmain acquired BTC.com. The wallet is available in both the browser and on mobile. The mobile wallet is supported on both iOS and Android. The private key for the wallet cannot be accessed by BTC.com. Users have a seed which enables them to access or to recover the wallet and will retrieve the seed when setting up the wallet. The wallet has many attractive features which make it a top consideration when it comes to Bitcoin Cash wallets. The wallet is hierarchical deterministic enabling users to generate multiple pairs of public and private keys. The open-source nature of the wallet allows its level of security to be assessed by the developer community. There is multisig functionality which enables users to require multiple signatures before transactions become valid. There is also the option to enable two-factor authentication to add an extra layer of security. The team behind BTC.com are hugely focused on making the wallet understandable to use and easy for beginners to adopt. The wallet is available in eight languages. There is a huge amount of content explaining the operation of the wallet online. The BTC.com team also regularly attend conferences such as Web Summit to guide beginners through setting up the wallet. Exchange wallets are considered the poorest form of security. There still remains reasons which users keep their funds in exchange-based wallets. Its convenient and saves fees on transferring in and out of a wallet. It also enables users to quickly capitalise on market opportunities when they appear. Some wallets can be difficult to operate but exchanges typically simplify wallets to be easy to understand. There is still significant drawbacks to leaving funds on an exchange. There is typically no way of knowing whether the exchange actually holds the funds. Kraken was the first exchange to complete a proof-of-reserves audit to verify that they actually hold users funds. They also provide a way for individual users to cryptographically verify that the exchange actually holds their funds. The majority of funds are kept in cold storage applying a high level of security. In regards to exchange wallets, Kraken is likely the best option. Kraken support Bitcoin Cash and also provided holders of Bitcoin Cash with Bitcoin Cash SV which was recently hard forked. This was convenient for those who held their Bitcoin Cash in Kraken’s wallet as they did not have to conduct the functions in their own wallet to receive Bitcoin Cash SV. It also would indicate that Kraken may provide support for future forks in the Bitcoin Cash protocol which hard forks every six months. If users are confused by wallets, one of the suitable exchange based wallets for beginners is Coinbase. 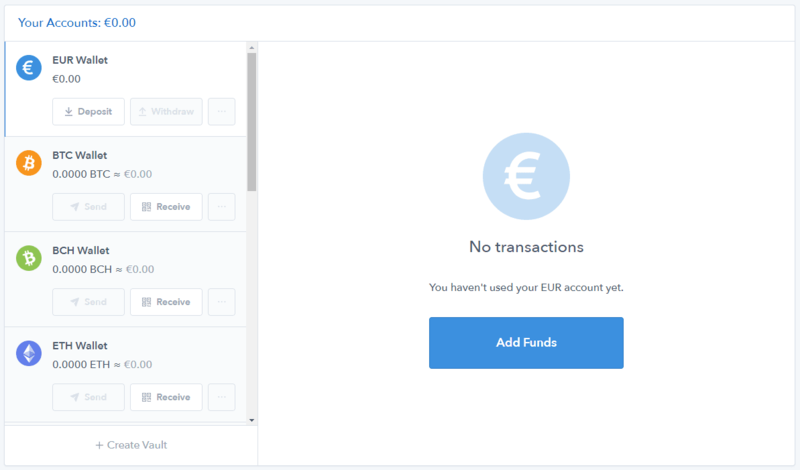 Coinbase simplifies the process of purchasing and storing cryptocurrencies. If Bitcoin Cash holders are using a wallet that they do not understand there is the risk that they perform a function which could result in them losing the funds. Exchange wallets such as Coinbase prevent this risk by making the process completely beginner friendly. The security of exchange based wallets is not optimal as the private key is stored by the exchanges and users funds are typically all stored together. Apart from this, Coinbase makes it extremely straightforward to buy and store Bitcoin Cash. Users can purchase Bitcoin Cash with supported fiat currencies by either depositing to their account or by using a prepaid card. Using a prepaid card enables users to purchase Bitcoin Cash in a wide variety of local currencies. Once purchased, Bitcoin Cash will be held in its own wallet and any fiat currencies deposited will have their own wallet also. One of the drawbacks to some users is that Coinbase asks for personal details to use their service. This will be a big drawback to users who wish to remain anonymous but it also offers its own advantages. Coinbase requires this information because of their strong emphasis on complying with regulations. This means that consumer protection laws may come into play if anything were to happen to users funds. If you click here you will earn an extra $10, and so do we, upon your first deposit.